It wasn’t socially acceptable for women to wear makeup before then so they were ready to put on their faces. Makeup is a billion dollar industry. We love the damn stuff. But have you ever wondered how makeup came to be, and how women used it in the olden times? That decade brings to mind glamour, flapper haircuts and art deco, amirite? 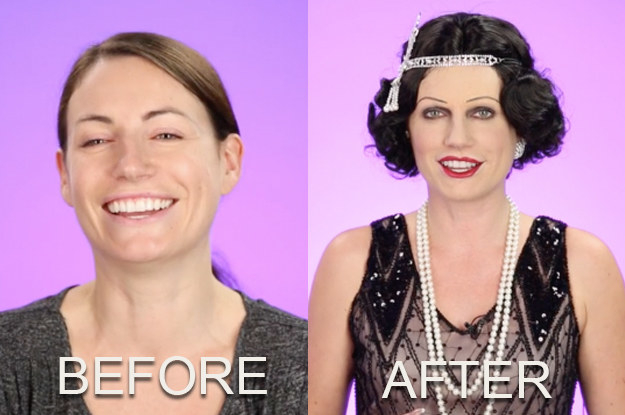 Watch her full transformation into a 1920s doll! Apparently wearing makeup before the 1920s was not socially acceptable so when women did start wearing it, they were bold AF. Visible makeup before then was often associated with promiscuity. Whatever! Let’s talk brows in the 1920s, shall we? Or maybe the lack thereof. The no-brows look was apparently all the rage. So much so that many women actually shaved their brows and would draw them back in. And for eyelashes? Well, mascara was invented just a few years before in 1913 by T.L. Williams. Yes, a dude. Back then it was made out of petroleum jelly and coal dust. Huh?!? He named this handy dandy new concoction “Maybelline.” Ever heard of it? Yes, it’s now one of the biggest makeup lines in the world. T.L. Williams reportedly combined the word “vaseline” with his sister's name ,Maybel, and Vóila! Maybelline was born. When it came to blush or rouge, women applied it in circles. Favorite shades were red and (believe it or not) orange. This is also the decade where the compact case was introduced. What-what! But what about the lipstick? Women then preferred the “cupid’s bow” shape where the upper and lower lip were overdrawn, and the cupid bows were ultra dramatic. There were also these creepy-looking lip stencils at the time that women used to try and get the perfect shape but something tells us this isn't the type of thing that's one size fits all, ya know? So armed with this knowledge, Chloe set out to find a modern-day expert, and came across Gabriela Hernandez. She’s the founder of Bésame Cosmetics, an LA-based, vintage-inspired luxury makeup line. She created this amazingly unique line after being inspired by the vintage makeup her grandmother left her. It was all so simple and yet the women always looked impeccably made. Among the line’s most popular items are their rouge ($18-$25) and their cake mascara ($25), which are most definitely inspired by this era. Ooh-la-la! After meeting with Gabriela, it was time for Chloe to undergo a complete 1920s makeup transformation. Bring it on! Ok, so she said NO WAY to shaving her eyebrows but said it was cool to cover them up and draw them back on. ZERO judgment. And the final result was DRAMATIC! She both loved the look, but also thought it was a little crazy. She went to show her co-workers the dramatic results and was met with looks like these. And hilarious reactions like this one! Yep. People were legit confused about the woman in the flapper costume with the penciled-in eyebrow look coming at them. Then she got to do something super FUN! She re-created iconic photos from that decade like this 1926 shot of Clara Bow. And this glamorous 1925 image of Bebe Daniels. And last but not least Chloe recreated this fierce photo of Louise Brooks taken in 1927. Overall, Chloe thought the Roaring 20s look was pretty cool but she was definitely NOT a fan of the no-eyebrows look. How would you feel about plucking off all your eyebrows? Watch Chloe try out a 1920s look from head to toe and recreate famous starlet flapper looks from the era.